Arlington National Cemetery is an enduring tribute to those who've dedicated their lives to defending the ideals of our nation. 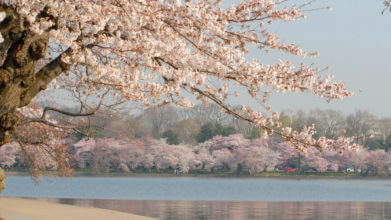 Explore the rich history of this national landmark from the comfort of our tour vehicles. *Pricing for active Military includes up to 4 family members. Pricing for Veterans includes one guest. A vacation to Washington D.C. would not be complete without visiting Arlington National Cemetery. Spread across 600 acres of rolling hills and beautiful gardens, this historic landmark is about 4 times the size of the National Mall and offers an exclusive tour service for guests looking to see the entire property in a manageable amount of time. Daily tours begin at the Welcome Center. A 45-minute loop gives visitors the chance to hop on and off at a variety of key points of interest. 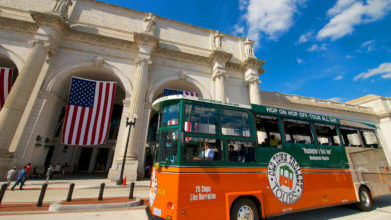 Don’t miss your opportunity to experience one of the most informative and awe-inspiring tours in Washington D.C.
*October – March: The last red loop Old Town Trolley will leave stop #10 (Lincoln Memorial) at 4:45pm to pick-up guests from ANC at 5:00pm and return them to stop #10. October 1 – March 31: Every hour on the hour. April 1 – September 30: Every half hour. January 18 – March for Life – Tours operate until 1pm. Guests must provide their own transportation to and from cemetery.